My instinct here says to use universal elimination on the first premise, generate Vx & Bx as a line, and then use existential introduction to finish it off. Any thoughts on how to approach this? I've done the following so far. Apologies for the poor formatting - I am assuming Fw in line 3. I started with a subproof for existential elimination and then within that subproof used universal elimination. This allowed me to choose the name, "w", in line 3 for existential elimination and use that same name in line 6 for universal elimination. For more discussion see chapter 32 of P. D. Magnus, Tim Button, J. Robert Loftis, Aaron Thomas-Bolduc, Richard Zach forall x: Calgary Remix. Not the answer you're looking for? 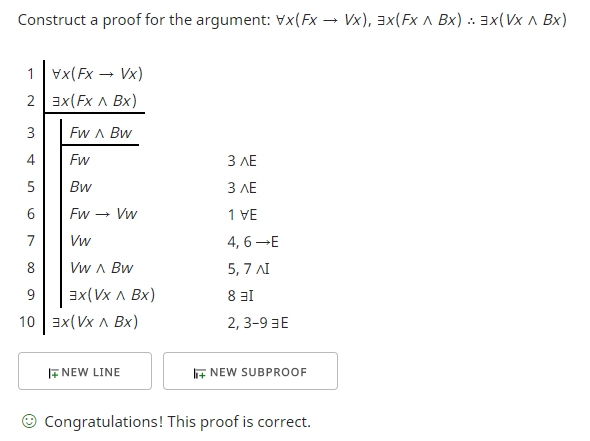 Browse other questions tagged logic symbolic-logic or ask your own question. Monadic Predicate and Polyadic Predicate?